Looking through the Internet, there are much howto’s specially in the OpenSource field but a guide line for a redundant and secure internet connection based on BGP (full table) is not something you find on many sites. So I thought I write such a documentation and I’m hoping it helps some networks admins in setting up their company internet connection. BGP is not that hard ;-). Using Mikrotik RouterOS devices as the routers in the config part, but the same setup would also work with Cisco or Vayatta routers, which I’ve also used for BGP based Internet connections. 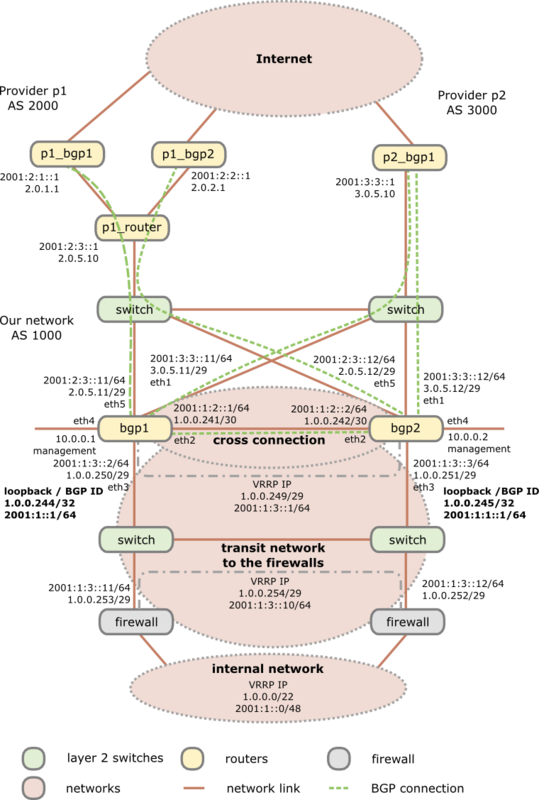 Following drawing shows the setup for the BGP Internet connection. As you see I’m using 2 switches as media converters and to distribute the provider transit networks to both routers. Why I do this as there are Mikrotik routers with SPF and SPF+ modules? First using a Mikrotik on a x86 provides you with no switching (just bridging). Secondly even if you use a Mikrotik Hardware router with switching support, a switch that is only used for layer 2 stuff and has no IP interface in the public networks (only in the management network) will be more stable specially concerning firmware updates than routers which are used for active interaction with other systems. No update for multiple years is not uncommon for switches in this scenario, which is not valid for the routers, specially if you use some special features on the routers. This means you can update a router without the Ethernet link to the provider going down and as the Mikrotik boots under 30 seconds its a minimal impact. The default switching time for BGP is 180 seconds (3*60 seconds) which is much longer than a boot after a firmware update. If not specified the configuration is the same for both routers and the syntax works with RouterOS 6.10, but it does not change that much normally, at least not since version 4 when I started using Mikrotiks. After the IP addresses and static routes are configured we need to secure our setup before doing anything else. As the BGP routers are in front of the firewalls they can get attacked directly from the Internet, sure, but traffic (e.g. attacks, P2P, …) to systems behind it can also make problems for the routers, so we’ll do something that we normally don’t do. We’ll disable connection tracking – we are a plain and stupid router … let the firewall track connections, we don’t care. This takes much work from the router if you’ve many many connections over it. Sure it makes the firewall settings on the router harder but as said, let the router focus on its single task – route traffic as much and as fast as possible. I sometimes see BGP routers overloaded with other tasks and than people complain that they have problems with high loads. If your network/uplinks is so small, that it does not matter, sticking with connection tracking is also ok – you’ll just can change the firewall rules to use connection awareness. Looks like a secure setup .. hopefully it also is :-). Now we’re ready to configure the BGP part, starting with the configuration of the instance. And now we configure our peers. For the 2 BGP routers which are reachable only via an other router we need to set multihop to yes. We need also to make a link between our 2 routers if one sees a peer the other does not but he still is the the VRRP master. That was not that hard, but what are all this filter names? As I told you in the beginning we’re paranoid so we don’t trust anyone so we’re filtering all routes going in and out. So lets start with the out filters as they are much easier. They just let us announce our own networks, so we won’t account networks of the one provider to the other and therefore make a link for them over us. The in filters are at little bit more complicated, but not that hard. We make sure that every AS path we get from the provider starts with his AS. It had happened that some provider are a little bit messy there. After this is clear, I only need to explain the reason for the filterIpv4Nomartians and filterIpv6Nomartians filters. Its quite easy, these lists contain IP subnets that we should not get via BGP, because they are not used on the Internet (at least not by good people) so we’ll filter them. Now we’re done with the BGP setup, only some OSFP stuff is left open. Why OSFP? We want to reach our loopback interfaces via the other router, as only one can be the VRRP master. BGP will only redistribute our complete network and the networks from the provides between our 2 routers, but not some parts of our networks – for this we need OSFP. And at last we send traffic samples to our SFlow server …. I would recommend you to have also a good SFlow server for your BGP routers. Now you could test your routers, but one last thing I recommend you to install on your router is following script written by MarkB. With one command you get something that looks like show ip bgp summary on Cisco or Vayatta and that makes looking at the BGP stuff much easier on a Mikrotik. Get the script from here. Any questions or improvement ideas on this setup/howto? And second, why you connect the first two switch between us? I use the same switches for the management network and this connection is used for this. The switches are also managed via this network. For the BGP setup itself the connection is not needed. I assume you use x86 machines for this setup. But let’s say if MT CCRs are used. Wouldn’t it be wise to drop all firewall rules and let it go fastpath? I mean, would it pose any security threats then? You can disable unnecessary services and those you do need, you can limit to only your allowed subnets.. The problem is not only the firewall. You can also not use the netflow stuff, sniffer or any QoS. Sure you can set the services to only accept traffic from specific subnets, but if you use a management network it is possible for an attacker to get over the BGP router into the management network. The other question is, do you’ve a 10Gbit internet uplink? As 2x1Gbit Uplink is possible without fastpath. And I can’t recommend more than 2-3 full feed IPv4 tables on a CCR, as the BGP calculating stuff is only done in one core. Well, as you’ve said “plain stupid router” for BGP and leave all other stuff to other machines that go further down the network? As for my planned setup, I’d like to use a couple RB1100AHx2’s for the task, have a single 1Gbit ISP uplink and now wonder if go fastpath or configure the firewall. We do not run full table. There are ~1k local routes announced by our ISP and a default route for the rest of the internet. Looking at the RB performance test table seems like I’d be ok with 1100AHx2 for a while if using fastpath. Without, I’m not so sure.. I always wondered why do people need a full bgp table. It’s not possible to keep provider specific routes from each direction, set up default with different metric, and filter out any other? Can you provide or show us the same configuration using WINBOX. Also i want to know the basic things which are required before BGP configuration. I don’t use winbox, but you just need to look for the same names. There is nothing different. Terrific illustration. What did you use to create the visual graph? Thanks. the second /30 is only part of your /29? Is this a typo or is it supposed to be like this? Yes, its a typo. 1.0.0.248/29 is correct – I corrected that in the article. otherwise the rule will only discard the exact prefix 10.0.0.0/8 but will accept 10.1.0.0/16, which is also a martian. – 168.254.0.0/16 should be 169.254.0.0/16. On chain=input, when you disable conntrack. Have you found a good way to allow updates of routeros through auto updates without disabling the last deny? queries upgrade.mikrotik.com. so I would allow traffic to from that server via HTTP? Thank you for your great guide. This helped us much replacing Cisco 7200VXR with CCR1036. Should the last line in the filterIpv4XXXXin filter not discard all remaining prefixes? the last action should be an accept as every IP address, that is not Ok got discarded before infilterIpv4Nomartians e.g. But i think the remaining prefixes in step 3 should have the wrong as-path and shouldn´t be accepted? According to Mikrotik VRRP examples / deployments, the VRRP ip is a /32. I have tested the VRRP config as per the article with /29’s and it works. Is there any difference / benefits not using the /32 VRRP ip’s? The /32 is the correct one according to a Mikrotik employee. I didn’t know that at time of writing this blog post. Entries and comments feeds. Valid XHTML and CSS. 74 queries. 0.115 seconds.